The Worst Part of War. ������ Captain Kyle Brown and Lieutenant Eric �Riggs� Rogers were on a training flight with four other F-16�s one fine day in March. They were both extremely good pilots, and with 39 years of flying between them, they were also the most experienced pilots on the base. They had both served their country on several war and peacekeeping missions, and were once again preparing for battle. ��������� Their country, the United States of Seabrook, had been an ally with the Republic of Geneva for a long time. So when the Republic of Geneva received information that a universally feared terrorist group, the A.C.A., or Association of Communist Activities, had mobilized troops against them, their first move was to alert the U.S. of Seabrook. The A.C.A. was an organization that reeked havoc on all countries with a Christian government. Bible reading in public schools, national days of prayer, and the public proclamation of the goodness of God were all things that their evil leader, who went by the name of Lucaso Stottoi, could not stand. Although no one actually knew Lucaso�s real name, he struck fear into the hearts of all his enemies. ��������� General Isaac Stinger was the first informed by Admiral Carins, who had received the call from Geneva, and he was also the first to recommend to Admiral Carins, that they should support their closest ally and friends as best they could. �Yes, Ma�am, sorry Ma�am.� said Stinger quickly. And with that, after tripping over the rubbish bin, General Isaac Stinger left Admiral Carins� office. ��������� Commander James Bruiser received orders to initiate a training flight to see who the most reliable and the most competent pilots were in his crew. When asked if he thought his pilots could handle the rigorous training, he answered typically with one of his most commonly used replies. He made the preparations overnight and his men, along with their personalized F-16�s, began take-off at 7:00 a.m. They were well and truly on their way by 7:15, and were approaching their targets by 7:30. ��������� Commander Julie King was enjoying a relaxing cup of coffee when she received orders from the General to ready her ground platoons for combat. �That�d be right,� she grumbled. �All work and no play. I�m tellin� ya�, I wish I�d never joined this organization. If it weren�t for the long service leave comin� up, I�d have left long ago. I hear there�ll be some good retirement packages next year�� and she kept rambling on all the way to her office. ��������� Captain Kyle and Lieutenant Riggs found themselves on the same squadron, as always. They were to fly into the Valley of Ircula, where they were to locate and destroy an unmanned missile launcher, which had been planted by order of Admiral Carins. They were then to continue through the valley until they came to Eagon Bay, where they would find an abandoned destroyer. They were to lock onto the destroyer with their missiles, but were ordered not to fire, because it was to be used for the ground troops in training. ��������� However, when they got to the valley, they ran into some trouble. There were children playing on the missile launcher that the squadron was supposed to destroy. Captain Kyle was the highest-ranking officer in his squadron, so he had to make a decision quick smart. �He is!� Riggs cut in. �HEY! !� Commander Bruiser was not happy. And with that, they stopped circling over what was the unmanned missile launcher and began pursuing the unknown bandit. ��������� It was a fair while before they got within shooting range of the intruder, and even then, Captain Kyle ordered them to hold. �Allrighty, Capt�n, let�s have some fun!� Riggs started some fancy flying while he sang the theme song from the Road Runner cartoons. �You know, sometimes I think that guy has got kangaroos loose in the top paddock.� When Kyle said this he tapped his temple for emphasis, even though he was the only one who could see. They flew behind the intruder, steadily pulling him in, and eventually were able to make out some numbers on the plane�s side. Kyle, who had been straining his eyes since the intruder came into view, was the first to see the flag painted on the side of the tail. Riggs stopped his frilly flying and quit singing the Road Runner song. Knights 3 and 4 broke to the left, Knights 5 and 6 broke to the right, and Kyle and Riggs decreased their altitude a touch. They flew on for a few minutes, gradually closing on the F-111, When there was an unwelcome call over the radio. It was Knight 3, and he sounded urgent. And with that, Knight 3 was blown out of the sky like a duck in hunting season. With that, Riggs was gone. �Riggs! Where�d you get to?� Kyle was relieved that Riggs was back to help Knight 4. Knight 4 did as Riggs told him to. He turned left really suddenly and dropped 50 feet immediately. At this point, Kyle bay-turned and locked on himself. �He�s locking onto me!� cried Riggs. Kyle fired, and sent the F-111to the ground in a burning fury. �Take your time, Knight 6. Don�t rush it,� warned Kyle. Daniel dove and turned. The F-111 attempted to follow, but Knight 6 was too quick for him. His bird was away, and dead on target. The F-111 pilot had no chance, and before he knew it, he was ash. �YES, SIR!! !� came the united reply. ��������� While Commander James Bruiser was having trouble with one of his squadrons, Commander Julie King was also having some trouble with one of her battalions. It seemed that the destroyer in Eagon Bay had attracted international interest, as well. The destroyer was missing. Field Officer Van Sing let out a low grumble and mumbled under his breath something about how Commander King would order him to cut a pineapple from a pear tree if she had the chance. What the flip�s going on out there? thought the Commander. She had heard about the planes, and now she had run into the same sort of dilemma. Things were not looking good. Immediately, all personnel dropped what they were doing, including the computer technicians who were upgrading the computers in the building������ ( three monitors were smashed, and five keyboards fell down the stairs. ), and stood to attention. �Positive, ma�am. The greatest strategist that ever lived said he would meet us on level 2 of the Royal Computer Art Gallery at 9:00 sharp.� General Stinger had a habit of forgetting minor details, like a.m. or p.m., and this was a classic example. �Uh, excuse me, ma�am�� asked a stranger, tapping her on the shoulder. The Admiral and the strategist Robert talked for hours on the best course of action based on their most recent information from their intelligence officers. All General Stinger managed to do was interrupt. ��������� Navy Fleet Commander Alison Bane was ordered to patrol the sea border with all 5 fleets under her command in the hopes of finding the missing destroyer. She was startled by a radio transmission that made her expect the worst. Sure enough, the case of the missing destroyer was now solved. It had been manned overnight, armed overnight, and fueled overnight. In fact, it seemed as if the thieves knew exactly when and where to find it. And to Commander Bane, that seemed to be a bit too much to simply be a stroke of luck. ��������� On her way down up to the bridge, she called Commander King on her mobile (she always carried it with her). With that, Commander Bane hung up. She walked into the bridge, literally. Davis rushed over and opened the door. �Yes, ma�am� the captain wheeled around to face his commanding officer. �Is that wise, Ma�am?� Davis didn�t like the way things were panning out. �Uh�� Davis didn�t like the sound of that. Commander Bane turned, and walked straight into the door, again. ��������� Special Armed Forces had been ordered to await further instructions. The number one crew of the entire Special Forces branch was the C.C.A., the Conclusion of Criminal Activity. And the head of this crew was S.A.F.� Commander Alan Greene. He had trained these men and women from recruitment, and he was pleased with the results he was seeing. Only last month, his team had successfully infiltrated a known serial bomber�s organization, and the killer was quickly brought to justice. But this was far more serious than a petty bomber. ��������� On his crew of specially trained individuals (because they can�t work together) was Technical Adviser Peter �Floppy� Gray, Risk Assessor Stephen �Cra-Z� Gawood, Negotiator Whitney �Lucky� Jackson, Weapons Technician Samantha �Trigger� Smith, Communications Expert Rod �Static� Bower, Intelligence Officer Kellie �Wats-dis-do� Banonn, and Information Accumulator Amanda �Snuff� Stellar. The group�s nickname was, fittingly, �the Impossibles.� These guys knew their stuff, and they were ready to get cracking. �Right-o, people! Are we�� Commander Greene never got the chance to finish his sentence, for at that moment, Smith started screaming her head off at Banonn. �ENOUGH!! !� Commander Greene had run out of patience. With that, he left them to get themselves together. In his private quarters, Commander Greene knelt by his bed, praying. �Lord, give me patience to work with that lot. Help me to shape them to be more like You. In Jesus� Name, Amen.� He rose, feeling much better than he had, and he went to pick up his diary, when he received a call on his mobile (he always carried his as well). �Hello?�Uh, yes, Admiral, Ma�am, I am free to talk�Well, what sort of mission did you have in mind?� Yes, Ma�am, the C.C.A. are on stand-by� Tonight? Isn�t that a little� No, Ma�am, I wasn�t arguing, I� Yes, Ma�am, I�m sure they could handle� Yes, Ma�am. I�ll let them know� Goodbye, Ma�am.� he hung up. �Then why did you come into my office so excited?� Admiral Carins was confused. Admiral Carins wrinkled her nose. �Yeah� great.� was all she could say. �Was it one of his cohorts? A sidekick? A dropkick?� he chuckled at his own joke. Admiral Carins just put her head in her hands. �Give me strength�� she muttered. �Maybe he had an apprentice�� Stinger was still going on. �One of our planes has been shot down? !� asked Admiral Carins incredulously. Stinger told her all about it, right down to Riggs verbally abusing Commander Bruiser. ��������� Captain Kyle and his squadron, minus the one who had been shot down, continued to chase the intruder aircraft. The F 111 had joined up with the other three, and they were preparing to engage in battle when another of Commander James Bruiser�s flight teams came to help Kyle�s mob out. �That�s debatable.� cut in Riggs. �You mean the Admiral knows about us?� Kyle was trembling. �We know that much, you idiot!� Daniel was never any good with any sort of repetition. �Show some respect, soldier!� Kyle was red as a beet. �Well, he�s right.� put in Riggs. �WHAT? !� every one of Kyle�s men was dumbfounded. The two squadrons split and went around both sides of the mountain. ��������� Davis was half way between the sinking destroyer and their own aircraft carrier. She was not happy. �Why should I be out here looking after this bunch of loosers? I�m going to have some serious words with Commander Bane when I get back on board, don�t you worry.� She knew for a fact that she didn�t have the stomach to confront a superior officer, but just saying that she would made her feel a lot better. Pretty soon, they came up to the first survivor. �Freeze! Don�t move!� Davis barked as she pointed her submachine gun at the person floundering around in the water. As it turned out, Davis� mother, Trish, had moved the ship because it was blocking her view of the bay. An old, retired war veteran who had captained the very same destroyer 40 years before, in the Battle for Polystyrene Coffee Cups, had assisted her. Davis put down her gun and ordered that the other bloke be found. They found him sitting in the only part of the ship still above the water� the bathroom. �What are you doing in here?� demanded Davis. �Alright, that�s enough.� Davis cut in. Things just kept getting better. First she gets sent as the only armed soldier into a potentially dangerous situation. Then she finds her mother guilty of the theft of a navy vessel. Now she is confined to a 15-foot rubber chase boat with a senior citizen and his weak bladder. What a wonderful day! Field Officer Stephen Van Sing had heard that the destroyer had been located. He and his battalion had been walking along the beach when they were confronted by a group of T.C.A. soldiers. Unfortunately for the T.C.A. guys, Van Sing�s boys and girls had guns, but they only had knives. Van Sing had them handcuffed, and was on his way back to the truck when one of them said something unusual. �You had better for to let us go,� the man said with a thick accent. It was obvious that English wasn�t his natural tongue. Just then, the foreigner put his hand down the back of his pants. �GET RID OF IT!! !� screamed Van Sing. The officer obeyed. He threw the water bottle as hard as he could. It landed in the army�s purpose-built, all-terrain truck. Van Sing was furious. He stood up and thumped the foreigner in the face, twice. Just then, the truck exploded. Everyone dove for cover. �Why you little��WHACK! Van Sing clobbered him, too. Sergeant Daniel Henderson walked up behind Van Sing. �Sir, I�� he never got to finish, because Van Sing wheeled around� and CLUNK! Broke Henderson�s jaw. �You�ll do as you�re told, young lady.� growled Commander Greene. This was when the message was conveyed over the loudspeaker. Commander Greene entered the administration office. Greene picked up the phone. He hung up and headed out to the loading bay where the rest of the crew was waiting. �Will you please get off my parachute�� said Peter Gray to Stephan Gawood. The two of them began pushing each other around. �Don�t call ME a wildcard, you prehistoric FREAK!� yelled Gray, giving Gawood a shove that sent him sprawling. Gawood recovered his feet in a flash. �The only thing prehistoric around here are your computer skills, Gray!� he punched Gray in the mouth. Gray fell back against the bus. �No one�s gonna die around here!� came a voice from behind them. Gray and Gawood wheeled around to see their commander standing with his arms and eyebrows crossed. He was not happy. �But what about the mission?� asked Jackson. �I said DISMISSED!� boomed Greene. �YES, SIR! !� came the united reply. �We have visual.� said Kyle as they rounded the mountain. �Is he always like this?� asked William. �I heard that!� said Riggs. �How come they get to be eagles and we�re only knights?� asked Riggs. All the Knights and Eagles went to battle stations, but there was always someone looking out for someone else. �Gee�thanks, Riggs. I just don�t know haw to express my gratitude.� said Kyle sarcastically. But Riggs didn�t have to worry about missing out on the action, because the action was going to come to him. Riggs dove to the left. Out of the corner of his eye he saw the enemy plane dive after him. �Eagle 2, I�m on it.� with that, Eagle 2 dove away to help Riggs. Riggs was having the time of his life. �Come and get me! !� he screamed at the enemy plane. The enemy pilot fired a missile. Riggs dove into a valley, and the missile hit a tree and exploded. �Come on!! Try aiming next time! !� scoffed Riggs looking back. He looked to the front and saw a waterfall right in front of him. �WOAH!! 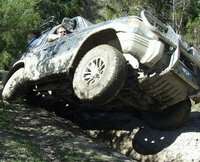 !� He pulled up and narrowly missed an overhanging rock. �HA!! I�m unbeatable today! !� he shouted. The enemy pilot fired again. Riggs dove back out of the valley. The missile hit a rock and turned it into dust. �OH, YEAH!! !� Riggs was hysterical. And there is little wonder why. His enemy had only one missile left, having fired 2 at Riggs already, and using one before hand, missing his target, again. �Come on, idiot! Try and make this one count!� Riggs felt invincible. He bay-turned and found himself facing his opponent. The gap between them was closing fast. The enemy pilot fired his last missile without bothering to lock onto Riggs� plane (he was very impatient). Riggs dove to the right at the last minute and skillfully avoided the missile. The missile hit some rocks and Riggs� plane was sprayed with loose particles. These particles bounced around the jammed missile, and knocked the obstruction, a tree branch (Riggs was a low flyer), loose. �HEY!!! I�m armed!! All right you sorry looking defenseless, senseless, brainless, toothless, toeless, uh� thingamajig� I�m gonna blow you from here to kingdom come! !� He fired� and missed. �DOPE!! Alright� this time I got ya!� He locked on, and just as he went to fire, the enemy plane exploded. �HEY!! What�s going on here?! !� He screamed incredulously. But Riggs was gone. Eagle 2 rejoined the others. By the time Riggs got back to the rest of the group, the enemy was eliminated, and they were escorting the original intruder back to their compound. The two captains laughed, and they all chatted merrily until they got back to the base. There was a muffled voice from the other end. It was almost as if Commander Bruiser was talking with someone else. All the aircraft landed without any trouble from the enemy plane. He was arrested and taken to prison, pending court. �That�d be right. Can�t manage a thing without good old Commander Bane.� she muttered sarcastically to herself. �Nobody can handle anything around here like the Commander. �Commander Bane! We need you to help clean the toilets! !� �Commander Bane, do this, we need you for that!� It never stops!� She rounded the last corner and slammed into a door that had absentmindedly been left open. �AARRGGHH!! WHO LEFT THIS DOOR OPEN?! !� she screamed at the top of her voice. No one answered. (Would you?!) She slammed the door shut and walked onto the Bridge. �What�s the problem now? !� she yelled. �That�s not what I was saying Ma�am. They didn�t actually arm the ship. It was a� a malfunction� on our end.� He hung his head, embarrassed. �A MALFUNCTION?!! I don�t put up with your incompetence so that you can feed me some story about a ...� she didn�t finish. Her phone rang. It was Admiral Carins. Davis took her mother and the other bloke down to the interrogation room, as ordered. She knocked on the door and waited. And waited. And waited. �YES MA�AM! !� Davis didn�t realize that her Commander was still asleep. She rushed out, grabbed her mother and the war veteran, and rushed back into the room. �Here they are, Ma�am! !� She yelled. �Huh�what the� DAVIS!!! What do you think you�re doing?!! How dare you wake me up in my own quarter�� Bane looked around her. This wasn�t her quarters at all. This was the interrogation room. �Well you definitely don�t have any trouble talking,� mumbled Davis. �Yes, Ma�am.� Davis didn�t move. �YES MA�AM! !� with that Davis was gone. So, Commander Alison Bane�s navy came back to port, and the crew of all her vessels joined James Bruiser�s air force to listen to the Admiral. Commander Alan Greene�s Special Armed Forces were on their way, and the only group not accounted for was one of Commander Julie King�s ground platoons, led by Field Officer Steven Van Sing. �Shut up! !� Van Sing was getting fed up with this guy jabbering on and on and on� he just never stopped! �Don�t bet on it�� said Van Sing. He reached into his pocket� and pulled out a mobile phone. �HA! !� he said defiantly, waving it under the foreigner�s nose. �HA HA!! At least I have the brains to have a back up plan! !� He turned the phone on. He dialed Commander King�s number. � Watch and weep! !� he said as he pressed �send�. But, to his horror, just as he got the phone to his ear, it let out three beeps, and then died. The battery was flat! �NOOOOO!!! !� Van Sing fell to the ground and began to kick and punch the dirt. �How could I have forgotten to charge this up last night?� He stood up and rushed to the foreigner. �You little�� He began to strangle the foreigner. As he did, Daniel Henderson walked up to him and handed him his beeper. Van Sing dropped the bloke and kissed Henderson. �Thank you, Thank you, Thank you!! !� he said as he sent a message to Commander King. Henderson couldn�t say anything. He had a broken jaw, remember? Within 45 minutes, a helicopter had picked them up and they were headed for the base. However, even with all this holdup, they still made it to where everyone was assembled before Alan Greene�s SAF platoon. They never got anywhere on time. �Come on!! We�re gonna be late! !� moaned Jackson. �What are you talking about?! We ARE late already!� snapped Bower. �You said that 2 hours ago!� complained Stellar. �Well, she�s right this time!� said Commander Greene. �You said that 2 hours ago, too! !� said Smith. Sure enough, though, they finally rounded the corner and arrived at the base. For anyone else, it would have been a fifteen-minute-trip. But Gawood had been driving, and, well, he didn�t know his way around very well. When he pulled out of the SAF compound, he had turned left instead of going right, and it just went downhill from there. But, alas, 2 hours and 5 minutes later, they finally arrived and Admiral Carins could finally talk with all of them together.